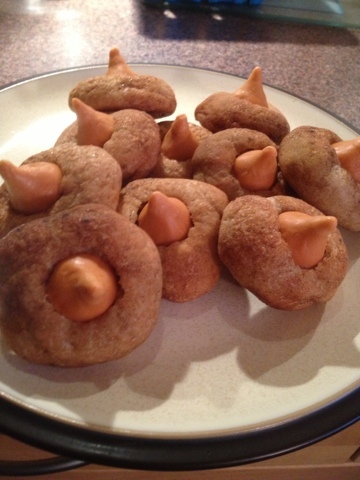 These cookie have been posted on Pinterest but I haven't been able to find the Pumpkin Spice Kisses, until a week ago! And I bought enough to make it through the winter! Combine the butter and sugar in the bowl of your stand mixer and cream at medium speed until fluffy, or with a hand mixer, for about 2-3 minutes. Add the egg, chai concentrate, and the vanilla, mix until combined. Add the flour, baking soda, and salt, scraping down the sides of the mixing bowl as necessary. Cover with plastic wrap and refrigerate for 1 hour. Using your hands, roll the dough into 22 to 24, 1 inch round balls. Place the dough balls on parchment paper lined baking sheets and sprinkle chai spice mix lightly over cookies. Bake the cookies for 12-15 minutes. Meanwhile, unwrap kisses. Remove the cookies from the oven and immediately place pumpkin kisses in the center of each cookie. Don’t touch or the kisses will turn into puddles! Cool completely.